I've been trying to get into a routine of setting up in the breakfast nook of the house and spend an hour or so 'warming up' before going into the studio to paint. Not a fancy concept, but you have to understand that routine and I have a hard time getting along. So far, so good. It's a lot like a morning jog before work, except that the last morning jog I went on was roughly eight years ago and things may have changed since then. These last couple sessions are based on strange dreams I've been having. Not the big dude and me jumping in a rain puddle though. That actually happened around six years ago.... ahem, let's move on. My buddy Scott commented in a previous post, completely relating to my pickiness with sketchbooks as sketchbook snobbery. Couldn't have coined it better, meself, good friend. I am happy to report that so far, this book is fantastic. 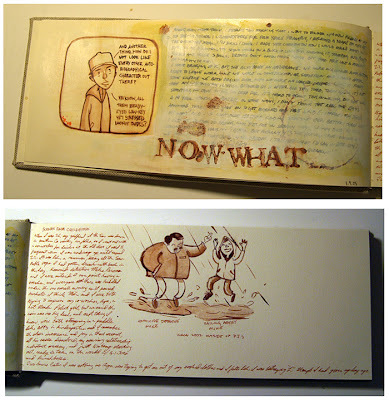 The "Now What" page is a bunch of acrylic glazes over india ink, none of which shows through the other side which the breakfast table entry above is on. I'm pretty sure the book is gonna double in weight and size with duct tape on the binding before I'm through with it though! The autobiographical treatment is for me the most important "problématique" of the comic book/sequential médium from the late 90's. I got in mind Authors such as Fabrice Neaud and Craig Thompson [for some reason, I feel that last one being more close to your sensibility and problematics/interest] and so many others. I can't wait to see your name added to that bunch of talented people. 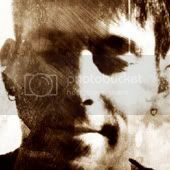 ;) And be very curious to see how this possible can grow.